Is it inarticulate to describe a film as, like, a really big bummer? 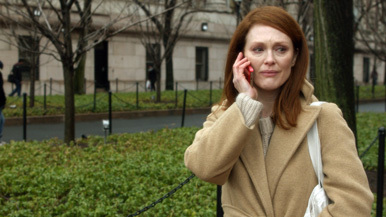 Because as reductive as that might be, it’s the first thing that comes to mind with Still Alice, the drama co-directed and adapted by Richard Glazer and Wash Westmoreland. The film is beautiful, evocative and brilliantly acted. It’s also a total drag, dude. Based on the novel by Lisa Genova, we meet Dr. Alice Howland (Julianne Moore) on her 50th birthday, at the pinnacle of a comfortable life in academia; her research into linguistics has become a widely-used textbook, she lectures around the world, her similarly-brilliant husband John (Alec Baldwin) is thriving and a trio of charming children (Kristen Stewart, Kate Bosworth and Hunter Parrish) are out of the house and (mostly) successful. As she begins to experience dramatic mental lapses, however, she seeks help from a neurologist; after an initial meeting, he brings up the specter of early-onset Alzheimer's. And, in the first of several low blows, it might be a rare, hereditary form. As Alice begins to live in decline, the script walks a tightrope: the characters say enough to be refreshingly frank, but not so much as to reduce the film to an unending complaint. Moore’s performance is one of grace and muddled despair, by turns inspirational and heartbreaking. Stewart is equally powerful as youngest daughter Lydia, who must deal simultaneously with her mother’s deterioration and disappointment (Lydia has opted to forego college for an acting career).